Malcolm Gladwell will be joining us shortly. For now, please submit your questions. 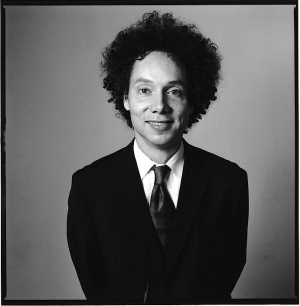 One of my college goals is to speak with Malcom Gladwell, so this is an amazing opportunity. How effectively can Jumo.com, the philanthropic start-up by Facebook’s co-founder, cause social change and activism? Will a platform for non-profits substantially increase participation/funds? And as a freshman at UC Berkeley, how can I create a tipping point for social service within my community? Do you think Twitter is good for ANYthing? let's start with the second question. Is twitter good for anything? Sure. It's a great way to keep in touch with the thoughts and activities and random observations of people who have a twitter account. That's not a trivial accomplishment. Sites like AOL and Myspace have come and gone, my question is, what do you think Facebook and Twitter will become in the future? And do you think the next big "networking" site will have the power to facilitate social activism, or is this medium simply too distant to be effective? I honestly have no idea what Facebook and Twitter will look like down the road--and nor does anyone else. The essential fact of the internet is that nothing is permanent. AOL was once the king of online--remember? I doubt that anything that is done electronically will facilitate social activism all that much--at least not unless you've put a real world structure in place first. Isn't the force of the social activism that was necessary during the CRM different from the type seen today because of a different type of problem (rather than because of different means/techniques for mobilizing and addressing the problems)? There is no real modern analog for the the CRM because there is no modern problem that is similar in form or scale. Interesting question. Is the environmental/global warming movement analogous? It certainly involves a similar kind of uphill battle against the status quo. Outside of the United States, though, I think there are plenty of very similar kinds of battles being fought. What role can Twitter plan in helping ensure the future of newspapers and magazines? Twitter will save newspapers once newspapers become capable of telling their stories in 140 characters. Hi, Malcolm. Thanks for taking the time out of your busy schedule to discuss social media. I'm in the information technology profession, so this usage of the Internet is highly valuable. I was curious how you felt about how social media is affecting people and their actual attachment to political issues. You discuss how Facebook and Twitter increase participation, but I feel as if it allows many users to simply get a very birds-eye view of issues, and they lack fundamental details, and thus causes them to never get the "big picture". I would agree, at least in part. What Twitter and Facebook are capable of doing is introducing a very large group of people to a subject or an issue. The hard part is getting them to go beyond that introduction and dig in deeper--and that leap requires some additional form of social engagement. The Obama election campaign did a very good job of doing both--augmenting social media tools with old-school grass roots organizing. To me, that's the gold standard. Yes, Shirky has written quite a bit that is relevant here. I'm not sure I took something representive though. Evgeny Morozov, who has written quite brilliantly on this subject, reviewed Shirky's new book, "Cognitive Surplus" and rather devastatingly took apart Shirky's example of South Korean digital activism. (Turns out there wasn't much particularly digital about those protests). I should add that I think Shirky is a superb thinker--and on issues other that social activism he says some really insightful things. Do you have a Twitter acct? What do you use it for? I think someone created a twitter account in my name, and tweeted things a whlie back. I'll confess to not being much of a twitter reader/user myself. I think there's enough reading materials and writing opportunites in my life already. You wrote in your article that social media traditionally do not ask much of people--that they are great at getting superficial involvement, not at driving social movements. Is the issue that social media *can't* or *hasn't* done this? In other words, is it possible for social media to drive meaningful social change? I don't see it frankly. Not unless (as I wrote earlier) it is married to some kind of traditional grass roots organization. The basic problem is that there are certain kinds of relationships that are only possible face to face. Its like asking--do you think it is possible for marriages to ever become entirely virtual? Well, no--not unless we considerably water down our definition of a marriage. Mr. Gladwell, the COO of Facebook and a Twitter exec both spoke at a marketing conference this week. In a way, they seem to be making your case for you, without much sense of irony. The description of the session led by the FB exec talks of "activisim" as a brand promotion tool. Do you think part of why social media reinforces the status quo may be because the stewards of the most succesful platforms seem to be selling them short? That's hilarious. If the civil rights movment were taking place today, do you think that some corporate entity would see it as a brand opportunity as well? Would Dr. King have done Nike ads? But yes, I'm not sure Facebook does much for real activism when they treat it as just another app. I've grown closer to colleagues and friends through twitter, and I believe its honed the writing skills of many a poet and comedian. Can you see this as useful at all? At last! A positive side effect of social media! I would guess it has improved the typing skills of many users as well. The crux of your argument seems to be that online activism is based on weak ties and decentralization. Aren’t there examples, though, of organizations “casting a net” on facebook/twitter/etc. in order to bring them into more traditional hierarchical organization? The example that springs to mind is my.barackobama.com, but I’m wondering what other examples you’ve come across. Absolutely. See my comment previously. In combination with grass roots work, it can be a very useful tool. Hello, I really enjoyed your article and I think a lot of the critics seemed to miss the point (weak-ties, strong-ties). What do you think of the criticism? I've actually been impressed by the seriousness with which many social media activists have addressed my arguments. One of the (many) strengths of the digital movement is its intellectual sophistication. That's why I thought it would be interesting to have this kind of argument with them. Does the hierarchical structure protect the activist org from intell collection or disruption? Are networked structures more vulnerable in that regard? Yes. That was one of the fascinating fingers from the work political scientists have started to do on networked terrorist/outsider groups. For every advantage networks give you (resiliency, adaptability, scale) they carry some significant disadvantages; they are really easy to penetrate and subvert. Oh--and they have trouble thinking and acting strategically. Some would say that if Twitter had existed in the 60's, the students who organized the Greensboro sit-in would have used it to spread the word. What do you think of this? Well, the historical evidence suggests that spreading the word was the one problem they DIDN'T have. The sit-ins spread throughout the South like wildfire. Twitter (like so many modern innovations) would have solved a problem they didn't have. See my previous answers. Yes. Totally agree. But they using the internet to augment an existing organization. That's the appropriate use. What do you think of Scvngr's attempt to "build a game layer on top of the world," recently profiled in the NYTimes and in a TedTalk? His thesis is that the last decade was the decade of building a social framework, and this decade will be for using "game dynamics" to normatively influence behavior within the already constructed social framework. Oy. Save me. This is what drives me crazy about the digerati. They refuse to accept the fact that there is a class of social problems for which there is no technological solution. Look. Technology is going to solve the energy problem. I"m convinced of it. Technology is going to give me a computer in ten years time that will fly me to the moon. Technology is going to build a car that goes 100 miles to the gallon. But technology does not and cannot change the underlying dynamics of "human" problems: it doesn't make it easier to love or motivate or dream or convince. Not sure why Facebook and Twitter wouldn't have complemented activism in the 60s by helping it spread faster. It is not just people with weak ties on Twitter and Facebook -- sometimes it is just a convenient channel for communicating with your stronger ties. This question goes to the nub of the issue. Why wouldn't Facebook and Twitter have helped activism spread faster? Well, first because there were plenty of other means of communication possible, even in the 1960's. :-) But also---more importantly--because spreading the word is not the issue! That was my whole point. When you are fighting a high-stakes, high-risk battle, like the civil rights battle, the issue is whether you can convince and motivate people to risk their likelihoods by acting in a disciplined and intelligent way against a formidable and dangerous opponent. Communicating with them is five percent of the problem. There have been many responses to your article posted online already. How many have you read, and do you plan on responding to them in more depth than this space allows? I've read some. But I'm on to the next story. Next up: General Motors! Really have to disagree with your comment Malcolm on twitter being a place of random observations. Speaking as a principal with 14 years in the field and now as an ed consultant, I collabrate with 1000's of educators world wide! I would hardly call our connections trivial or random. Of course. Not all communication on Twitter is random. you note on that "eventually" Some seventy thousand students eventually took part. Isn't this the point? It took quite a while to get things going in the protests. Today, hundreds of thousands can get involved almost overnight? See my earlier response. The issue isn't informing people. It's organizing people. Twitter is great at the first. But not so great at the second--and Dr. King and his counterparts needed organizations, not communications tools. Remember in the 1960's you could reliably reach upwards of 95 percent of the black community in urban areas in the South through the church. And there you had their undivided attention for an hour! Who needs Twitter when you have sermons and regular prayer meetings? Why don't you tweet more often? Life is too short. No, seriously, everyone has to determine what the best use of their time and energy is. I have many friends, who I respect, who tweet. I don't, because I worry that the time I devoted to tweeting would take time away from things with more impact and permanence. Without completely oversimplifying your argument/article, is the fundamental difference between Twitter/Facebook/social networking and revolution akin to reaction versus action? The revolution you wrote about required real effort and actual presence, while social networking is more about reacting to ideas put out by someone (anyone) and doesn't really ask the target audience to get involved beyond retweeting or pressing the thumb's up icon on a page. Is 140 characters sufficient to convey their message? How can we as social activists convey our message in 140 characters? That was 119 characters. You have 21 left. Why do you think people get so defensive when Twitter is criticised? Wierd, isn't it? Do you think it would make matters worse if I admitted that I also hate the iphone? Speaking of structure, how do we --"the collective"-- return to sustainable social activism and change if so frequently distracted by the random ponderings and information streams of FB, IN, Twit et al? Good question. I like the way you reframe the issue in terms of attention. Surely the issue in our day and age is not reaching people with a mesasge. It's getting them to focus on the message. We've taken enormous strides in improving the first of those. But maybe, along the way, gone backwards on the second of those challenges. I would like to know if you can give an operational definition of the term "social media". So far, I have not yet met anyone who can, so the term seems to be meaningless. Malcolm, the twitterverse has noted that you hardly use twitter at all- how does this influence your opinion of the service and what it can be used to accomplish? I have nothing against Twitter. And I'd use it if I had more time. . . Here's the deeper issue for someone like me or, for that matter, anyone contemplating using tools like Twitter. What is it you want to accomplish? Do you want a broad audience? Or a deep audience? In other words, would you rather do the best possible job engaging with a small but focused audience. Or would you rather spend your marginal hour reaching a large audience on a superficial level? There are lot of situations where the latter is a reasonable choice--like if I'm selling something, or announcing an event, or sharing a small but crucial bit of information. But I'm interested in exploring ideas in depth with the (small) group of people willing to geek-out with me. That makes strategy A a better choice. Oh yes. There is enomrous potential here for using closely structured networks to influence health behavior. In fact, there was a fascinating piece in Science a few weeks ago on this very issue. I really don't like social networking in general. Any tips on how I can be critical of it without sounding like a 70-year-old man? What's wrong with sounding like a 70 year old man? I do it all the time! 70 is the new 18! Twitter (currently) has been a great tool for making business connections. I wonder if you think it will ever become 'corrupt' in a "myspace" way where the line between truth and lies is so bad that no one trusts it anymore? It took the civil rights movement a long time to draw attention to its cause, but once television cameras were at the Edmond Pettus bridge and beamed the brutal repression into America's living rooms, the movement really turned a corner. Would the ability of the Freedom Riders to have posted videos of what they encountered to a Facebook account have created an earlier awareness of the brutal violence in the south? Interesting question. I was going to go into this in my piece--and ran out of space. One of the least understood things about the Civil Rights Movement is how skillfully they manipulated the news meda. The showdown with Bull Connor in Birmingham was a great example: they pushed Connor into over-reacting, knowing that the resulting images of German shepherds attacking peaceful marchers and children being hit with powerful hoses would do more to advance their cause than anything else. The reason this worked is that in the 1960's the mass media really was mass: you could get a 50 percent share for a compelling news story on the nightly news! Today they would have to use Facebook--but in the absence of a mass media that strategy would have been less effective, not more. Hi Malcolm--You only follow eight people on Twitter, and none of them are individuals. Does this mean that you think Twitter is better as a means of getting your ideas out there, rather than following the ideas of others? That's not me! I've never twittered! The person calling himself Malcolm Gladwell follows eight other twitterers! Angus Johnston in the Huff. Post says you don't understand social networks. http://www.huffingtonpost.com/angus-johnston/what-malcolm-gladwell-doe_b_741916.html If you had a chance to read the article, what is your take on his perspective? I think what he means is that I don't agree with him. Incomprehension is simply what a narcissist calls disagreement. A couple weeks ago, on this NewYorker.com online live chat, I asked Rick Hertzberg why he's not on Twitter. He said there's no reason to be on Twitter and likened it to heroin & torture. Did his opinion play any role in this story of yours? Yes, there are my co-workers. Thanks for joining in, everyone. I thought the questions were great!